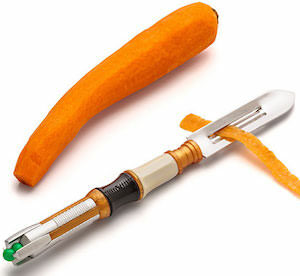 We Doctor Who fans all know that the Sonic Screwdriver is useful for many things but now there is a special version to help with peeling vegetables. As you can see above the potato peeler looks a lot like the Sonic Screwdriver used by the 11th and 12th Doctor, the end seems different because that is where the peeler is. Now you can make all kind if meals with the help of the Sonic Screwdriver from Doctor Who. Just imagine you tell your friends that the meal was made with the Sonic Screwdriver. The Sonic Screwdriver peeler is made from plastic and stainless steel and is dishwasher safe so that even cleaning it is easy.